I am currently obsessed with this blueberry cheesecake filled french toast. Made with added protein for a more balanced breakfast! In a small bowl combine yogurt with protein powder and mix well until smooth and creamy. You will have extra leftover which you can use as a topping or to make another serving of french toast. Spread mixture on a slice of bread. Set aside. Microwave blueberries for 1-2 min until soft and juices start to flow out of the berries. Add chia seeds to help thicken up blueberries and let sit a few minutes. Spread a couple spoonfuls of the blueberries on top of the yogurt/protein mixture. Save some of the blueberries for topping after cooking. 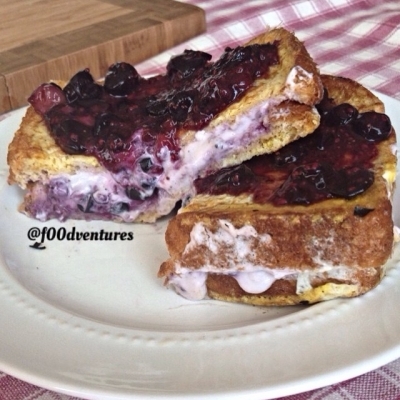 Cover yogurt/protein/blueberry mixture with another piece of bread and carefully dunk in eggs. Cook up in a skillet for a few minutes on each side. Top with a spoonful rof blueberries and enjoy.